Staff at a Wigan pharmacy have told C+D it is “business as usual” for the team and patients, after a car crashed into the front window on Saturday. Has your pharmacy ever been damaged in an accident? Possibly put a NO ENTRY sign on the shop windo in very BOLD and CAPITAL letters. It might help !! Brush yourself down and back to work people. Nothing to see. Hopefully no damage to the consultation room so those impactful MURs and NMS can kep being performed. 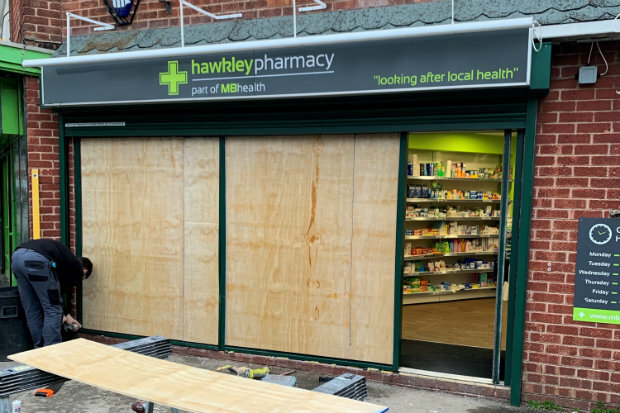 Well, we've had the 100 hour pharmacy, and the online pharmacy, so I suppose it was only a matter of time before a 'drive-through' pharmacy concept would come to fruition. There already are a few drive thru pharmacies! Can we take a moment to appreciate the AAH totes that sacrificed themselves to protect those shelves? Also, everyone seems to be heading towards the carbon grey and snot green look these days. "But I've got a car waiting inside." Just a tickle !! Anything to do with the Viagra poster on the Entrance Door ??? Just a thought. More a reason, not to have Parking in front of the shop. Or at least have some kind of a strong barrier between the Parking lot and the shop front. Thank god no one was hurt.